In addition to the previously considered Compressed Memory feature of the upcoming OS X Mavericks, which aims primarily to make the most efficient use of available memory while enhancing battery life on the side, Apple has profiled two other advanced features of the new release that are aimed directly at extending battery life and two enhancements targeting web browsing and video playback. The first is App Nap, a new OS architecture feature that monitors each running application to determine what priority it should get in terms of processor, network and disk resources. For example, if an app is running invisibly the background, OS X Mavericks can transfer disk and processor priority to the foreground app, improving the apparent responsiveness of the system. The system analyses several factors to determine which apps should get full access to the CPU, storage and network resources and which should be throttled back. Among the heuristics Apple applies to calculate and assign priority are whether a background app's windows are even visible or whether it playing audio the user wants to hear. Developers can also opt out of App Nap while performing an important task. But Apple's overall design philosophy for App Nap keeps the feature active by default for apps in the new release, requiring fewer necessary changes for existing apps in order to benefit, while delivering the greatest energy savings possible. Developers can also make minor changes to take even fuller advantage of the new feature. App Nap gets particularly aggressive in throttling back less important tasks when the user is running on battery power. A series of actions seek to keep CPU cores, disks and network devices idle and in low power modes as much as possible. Integrated with App Nap is a parallel feature named Timer Coalescing that aims to coordinate the resource demands from different apps and background task so that once system resources are awakened to do necessary work, a variety of other pending tasks can be performed at the same time. This delivers real results in efficiency because without such coordination, the system's components must be constantly woken from idle to handle a flurry of randomly occurring tasks, preventing the system from ever getting enough sleep to take advantage of idle mode power savings. 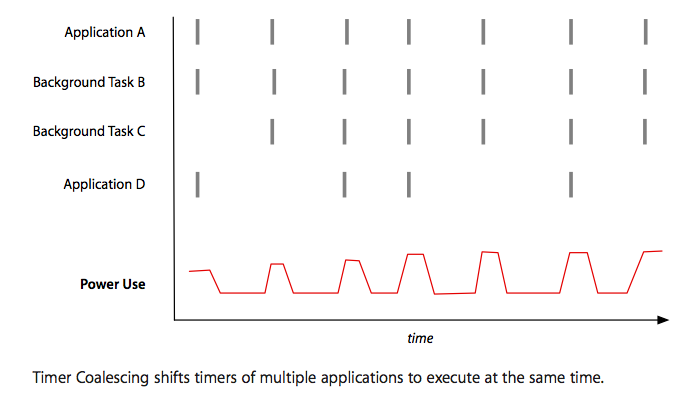 With Timer Coalescing, the system's various tasks are either deferred or shifted so that they can be executed at the same intervals, enabling processor cores to go fully idle for longer periods of time in between. 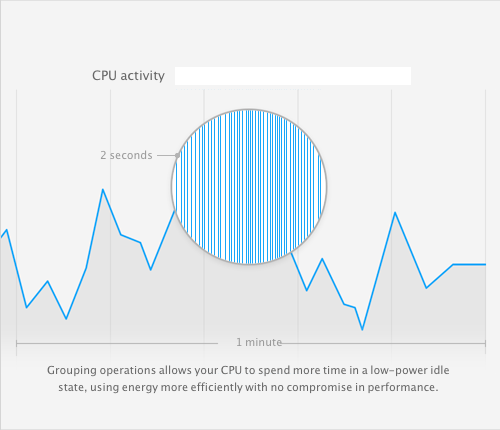 "Grouping operations allows your CPU to spend more time in a low-power idle state, using energy more efficiently with no compromise in performance," Apple notes in its OS X advanced technologies preview of OS X Mavericks. 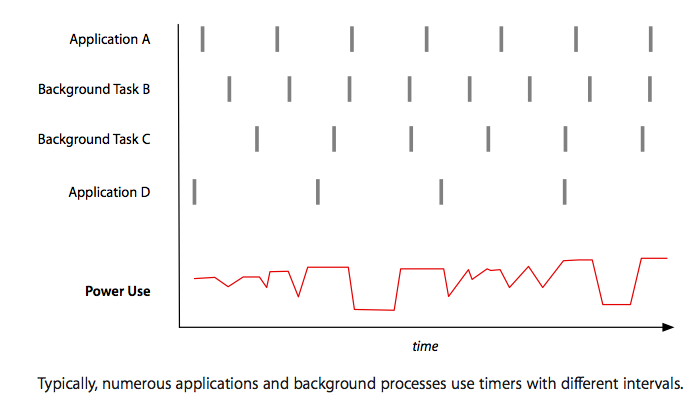 Timer Coalescing's coordination of tasks is illustrated in before and after images portraying a 2 second snapshot of activity (below). 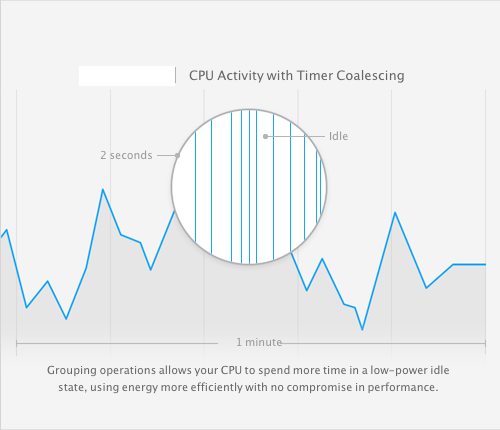 "This can dramatically increase the amount of time that the processor spends idling," the company adds in its core technology overview. Apple notes that OS X Mavericks new efficiency features can reduce battery consumption by up to 23 percent, with little or no impact apparent to the user. Noted in our previous report on enhancements to Safari 7.0, Apple is now suspending web plugins until the user decides to view them. "Many websites display animations using power-hungry plug-ins that can drain precious battery life," Apple notes in a feature aimed directly at Adobe Flash animations and ads. "The new Safari Power Saver feature recognizes the difference between what you came to see and the stuff you probably didnt. If the content is front and center it plays as usual. But if its off in the margins, Safari Power Saver pauses it. Youll see a static preview, and it wont run until you click to play it." 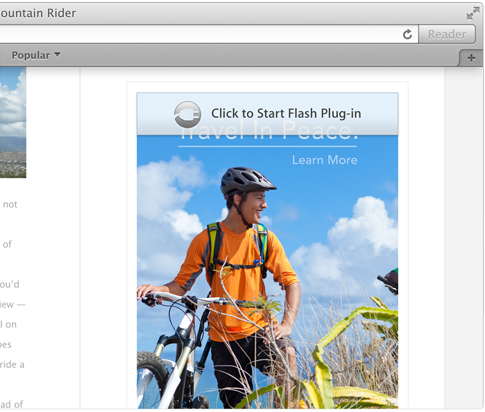 This feature works similar to the existing "Click to Flash" plugin, displaying a placeholder users can click to load as they choose (above). Apple says that with the new feature, "browsing websites with plug-in content will use up to 35 percent less CPU power." 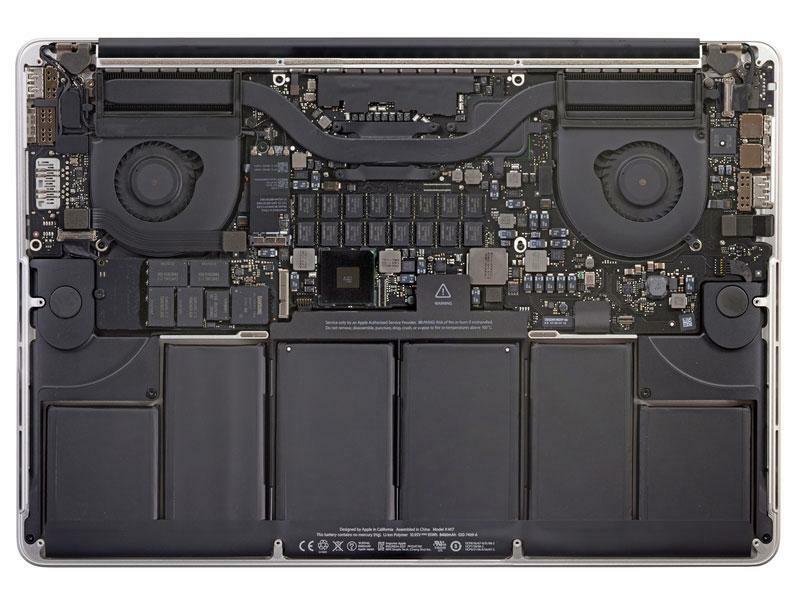 Combined with other advances in Safari 7, Apple claims a performance advantage over both Mozilla Firefox and Google Chrome, while using significantly less power than either alternative (below). Also new on the battery efficiency front in OS X Mavericks is enhanced support for offloading media playback to the GPU to take full advantage of hardware acceleration. In the new release, OS X's "video playback engine takes greater advantage of the efficient graphics hardware in your Mac and reduces the frequency of disk access," Apple states. The improvements apply to both audio and video playback. Apple says users can "go ahead and watch iTunes HD TV shows and movies full screen even when youre unplugged" and states "your CPU will use up to 35 percent less energy while youre watching video." Apple's focus on MPEG H.264 standards-based media playback and its optimizations for hardware acceleration on both OS X and iOS stand in stark contrast to efforts by Google and Mozilla to push ideological objectives that relied upon less sophisticated and efficient software codecs. Google's efforts to subvert H.264 playback on the web with its own WebM have not only failed to gain traction, but have done so at the expense of optimizing Android or ChromeOS to play real world media, leaving its users with devices that run hotter and deliver either inferior playback performance or require massive batteries.